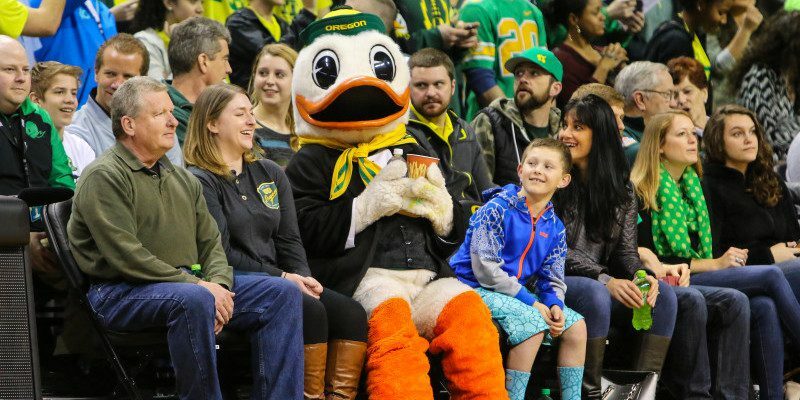 The Oregon men’s basketball team continued to barrel down the stretch with another big win at Stanford last night, and with a second or third place finish in the Pac-12 now secured, March Madness is all but upon us. The victory all but locked the Ducks in as a middling seed for the Dance, and ensured Oregon would at least be competing on the big stage for several weeks to come. If the team wants to make a deep run and outpace last year’s round of 32 finish, however, it’ll have to focus on a few keys that have characterized its recent success. 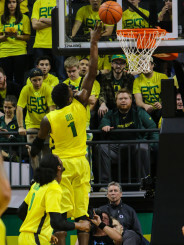 Jordan Bell is another downlow Duck threat. Scoring: The Ducks don’t try to throttle their opponents so much as race them to 75 or 80. They force fewer than six turnovers per game and allow an average of 71 points. Fortunately, they are also leading the Pac-12 in scoring, and put up 75+ per game, good for Top 25 nationally. The Oregon offensive has threats in every area of the floor, from forward Elgin Cook, who puts up 13 points per game with a staggering .512 shooting percentage, to field general Joseph Young, the only Duck to outscore Cook with 19.9 per game, to shooting guard Abdul Jalil-Bassit, whose .426 percentage from downtown makes him too much of a threat to overlook. In short, you can’t contain the Quack Attack. The Ducks love to run. Transition: Much like their gridiron counterparts, the hardwood Ducks thrive on speed, creativity and momentum. They love to run, and consistently try to pick up the pace by taking opponents out of their half-court game. Oregon knows it’s undersized, and won’t try to grind down its enemies with a lane crunching landlord or a 30-point defensive odyssey. Instead they’ll continue to take long shots, get long rebounds, create space and thrive on the chaos of the full-court. This team wants to get up, get out and go. Duck dynamo dunks it home. Joseph Young: The kid is killing it; everyone knows it, and no one can stop him. Mighty Joe Young leads the conference in points, points per game, field goals, three-pointers and free throw percentage. He’s a slasher who can create opportunities for himself and then take advantage of them, but he’s also the team’s point guard and field general. Young averages 3.6 assists per game as well, also Top 10 in the Pac-12, and boasts a solid 1.63 assist-to-turnover ratio. In short, Young is the heart of the Ducks, and we need him to keep us pumped up.